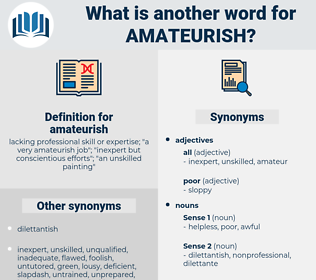 What is another word for amateurish? 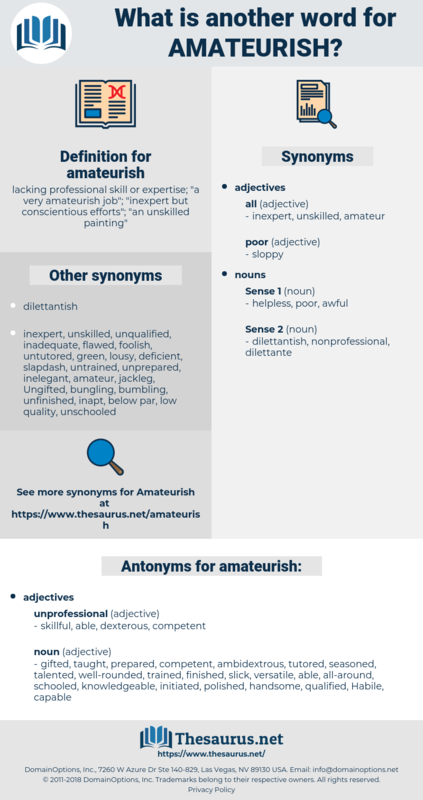 lacking professional skill or expertise; " a very amateurish job"; " inexpert but conscientious efforts"; " an unskilled painting"
gifted, taught, prepared, competent, ambidextrous, tutored, seasoned, talented, well-rounded, trained, finished, slick, versatile, able, all-around, schooled, knowledgeable, initiated, polished, handsome, qualified, Habile, capable. The rejection of the symphony - anything but an amateurish piece of work - still rankled in him, almost as bitterly as in Ivan. He raised one hand and thoughtfully stroked his nose - recently broken with workman - like thoroughness and reset with amateurish imperfection. anemometric, anhydrosis, antares, anthriscus, ant thrush, ammotragus, antrozous, andricus, antidorcas, anthracosis, antrorse, anhydrous, andrews, anthrax, amaterasu, anhidrosis.